Brabus are once again trying to set standards higher. With their programme for the new super sports car of Mercedes' sub label AMG, the Germans offer some more than just re-styling or extra zest. They focus on sportiness, better aerodynamics and weight reduction, on the one hand. On the other attention is being paid to soften the character of the SLS. And, you can have one with the other on the car. Of course, all that technology is as sophisticated as it is expensive. when the gate is closed. Opening it makes the sound 'sportier', as Brabus say. Meaning, it's louder. Those who expect the system to enhance power output will be disappointed. At least Brabus don't say a word on this. On the other hand they mention to be still developing an engine upgrade for the 6.3 Liter V8 motor. And there won't surely be nothing wrong in anticipating that the engineers in the factory at Bottrop are heading for some further superlatives. As with the exhaust system, the driver is also enabled to order the suspension to make the car being a good or a bad boy. Thanks to the so-called 'Smooth Ride Suspension' damper settings can be adjusted from the cabin too. This allows 'sportier', meaning harder driving manners, while at the contrary adjustment, damping quality is even softer than AMG's original set up, Brabus say. Maximum lowering rate is 40mm. To overcome obstacle, 50mm more ride height will be provided by a push of a button by the Front Lift System – a feature which is currently under preparation for the gullwing Merc. When it comes to the interior, things become more boring, ostensibly. Brabus offer the whole stuff we already know: Sports steering wheel and pedals. 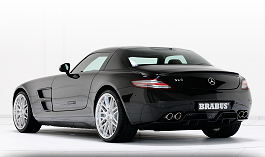 And, scuff plates with illuminated Brabus logos - don't think about weight reduction. And, on demand, the workshops cover all parts with leather or Alcantara, unless they have to be left transparent. And, contrasting or matching stitchings can be chosen too. But no other offering keeps us as excited as the optional speedo, which scale ends at 400km/h. Especially because Brabus advertise this as a hint to the car's future performance with engine tuning.